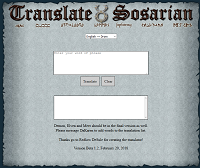 Like a putz, I agreed to build this language translator for some languages spoken in this ancient game, Ultima Online. I maintain the code, but not the appearance. The basic principle is to take words inputted, explode them with PHP where I find spaces, and run them through arrays of English and the fictional language (which are dynamically created from .CSV files). When it finds a match, it spits it back out.